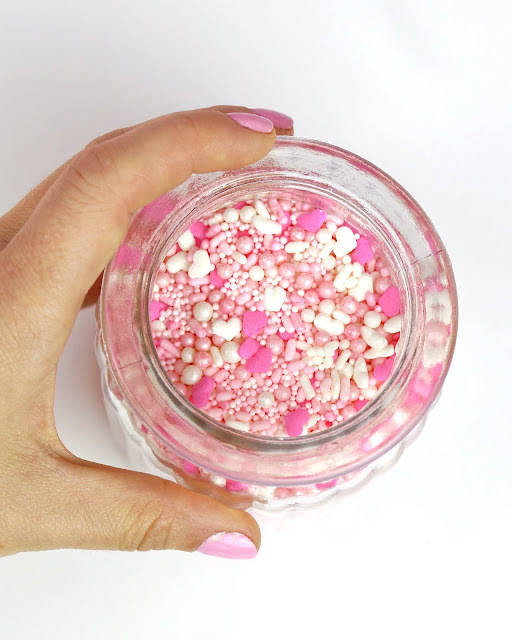 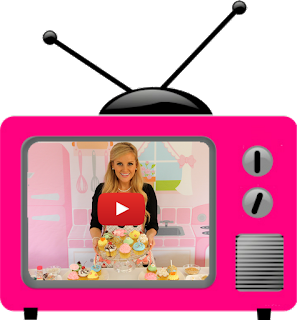 Here I show you how to tint sprinkles with food coloring and even flavor them with extracts! 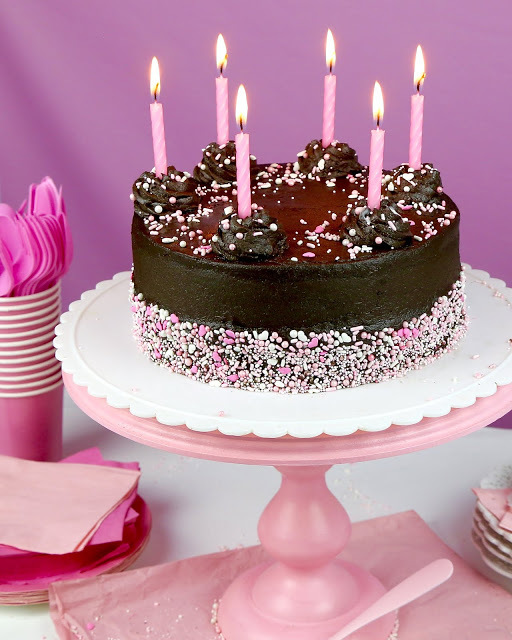 Anything from jimmies, to nonpareils, sugar pearls, or sugar crystals to totally customize your cupcakes, cakes, cookies or ice cream. Then, you can mix them up to create your own custom sprinkle blend to match any occasion! 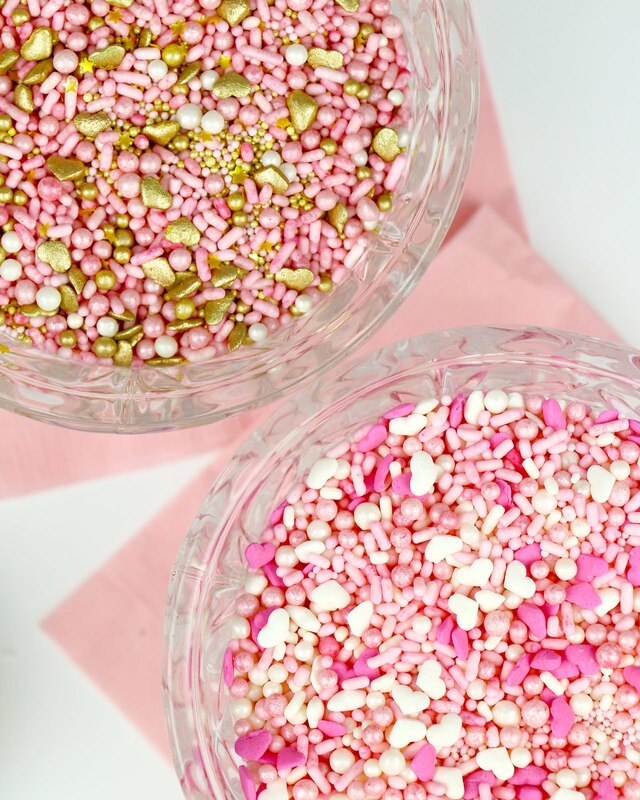 These are great for making to match the theme of any party or event. 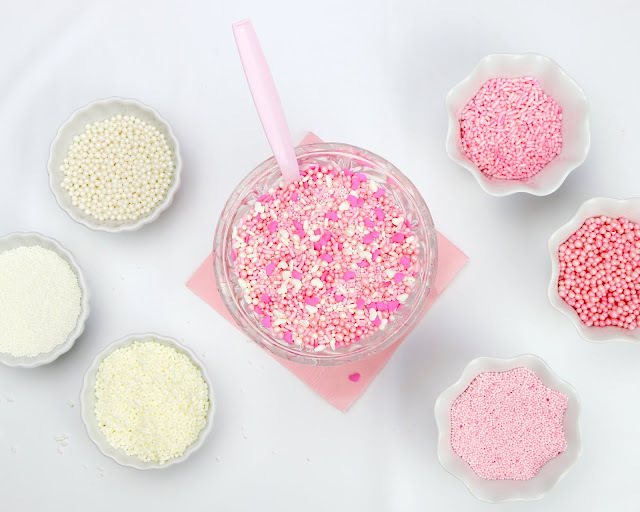 Show your school spirit, perfect for a birthday, bridal or baby shower, create special holiday themed sprinkles, showing off your team spirit for a sports game, even package them up in little bottles or mason jars to give away as a sweet gift or favor! 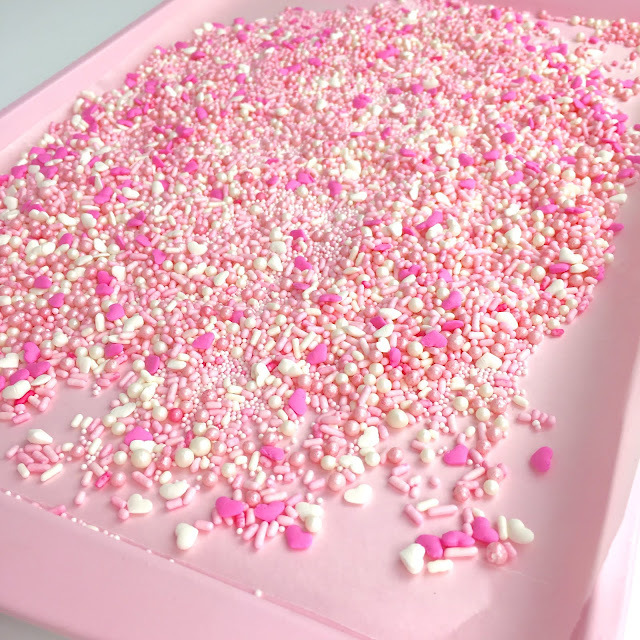 I made these mainly because I wanted to decorate my cake with, what else? 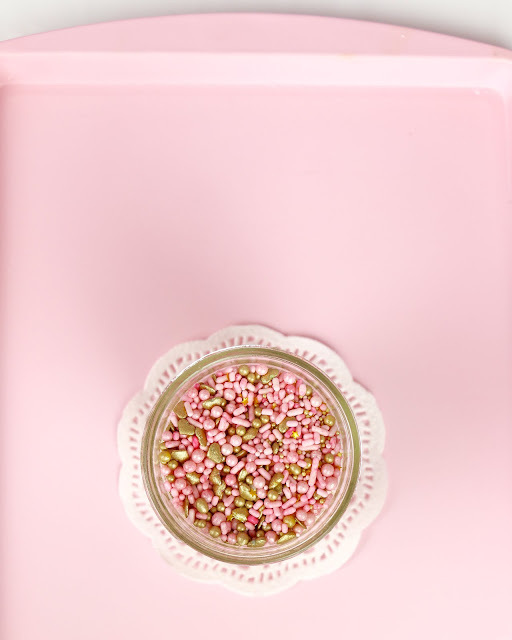 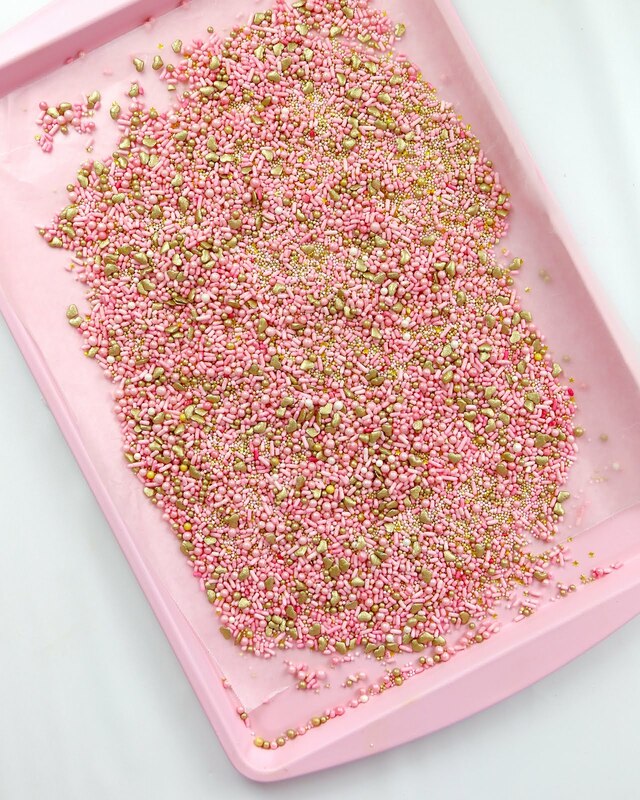 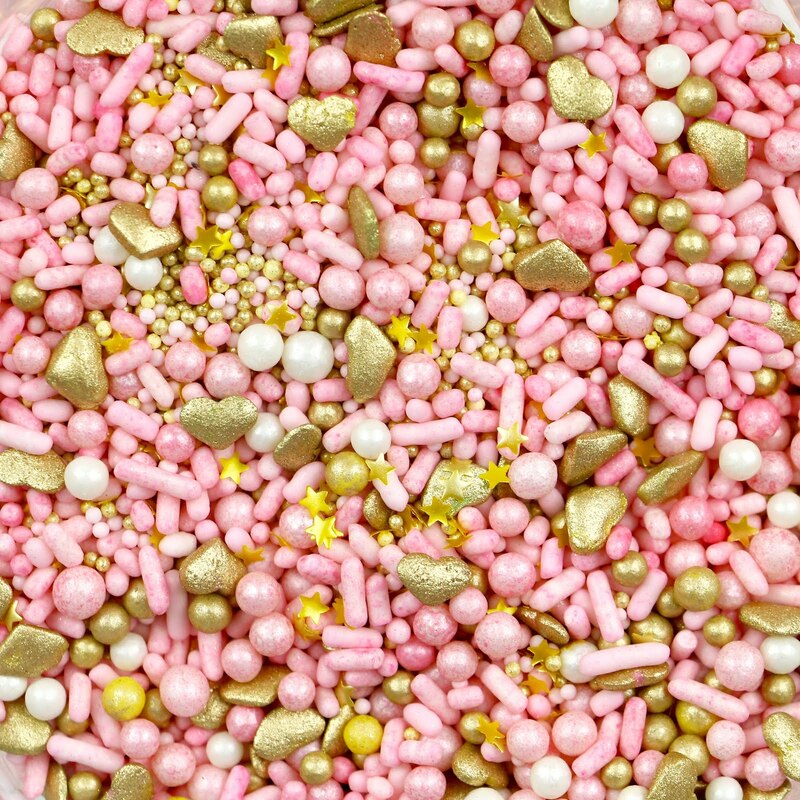 PINK sprinkles, sugar pearls and beautiful gold pops of glitter... well, I couldn't find the perfect shade of pink, so I decided to make my own and couldn't believe how easy it is! 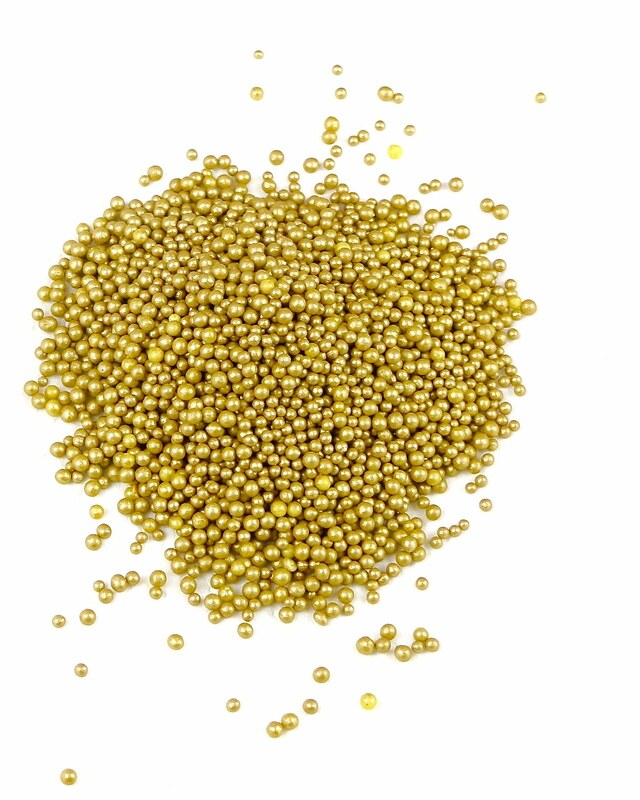 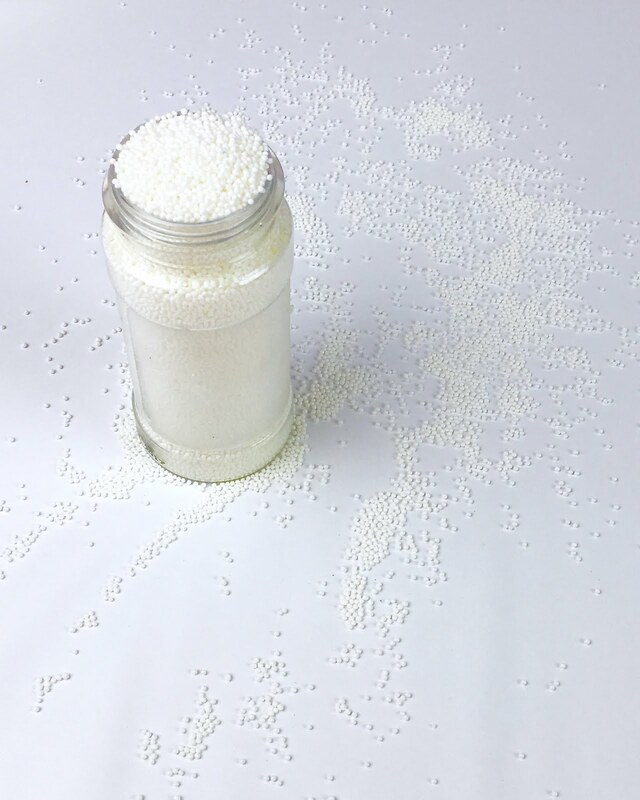 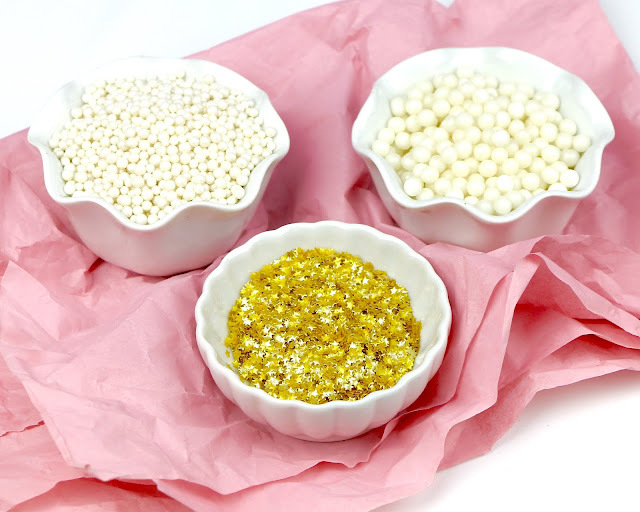 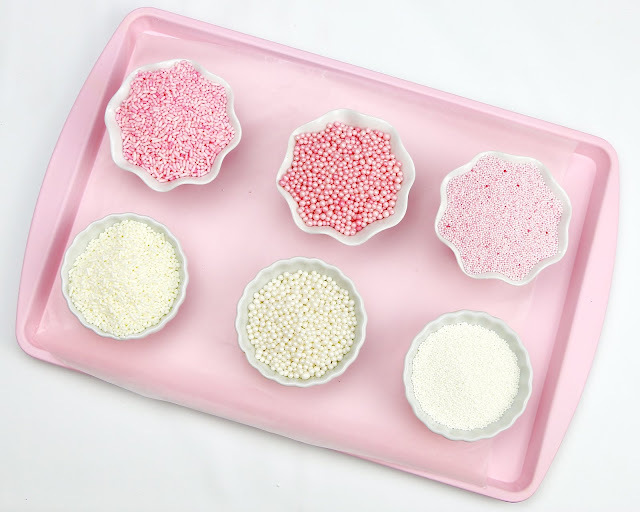 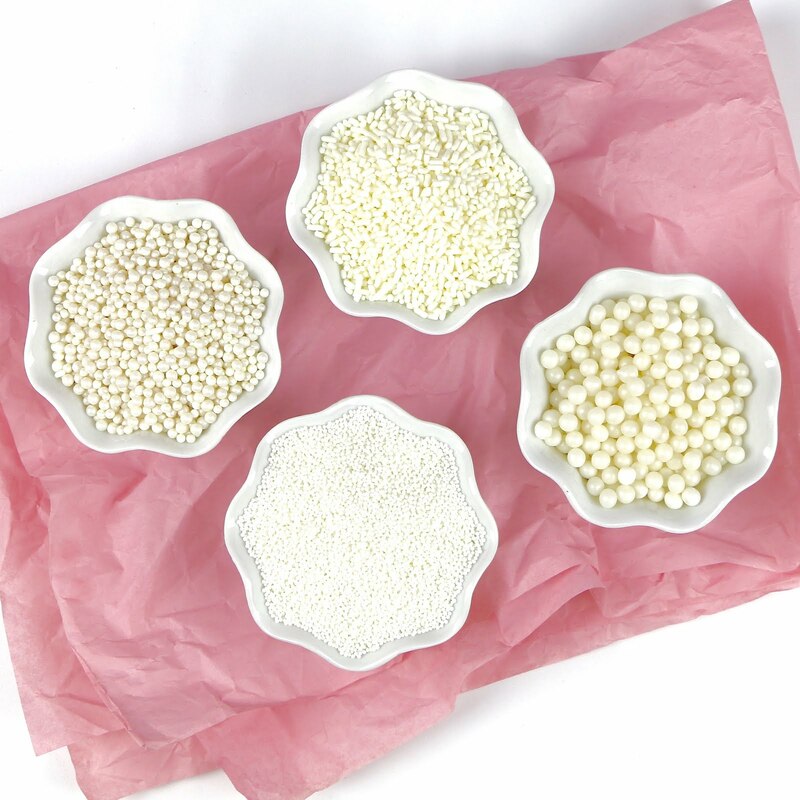 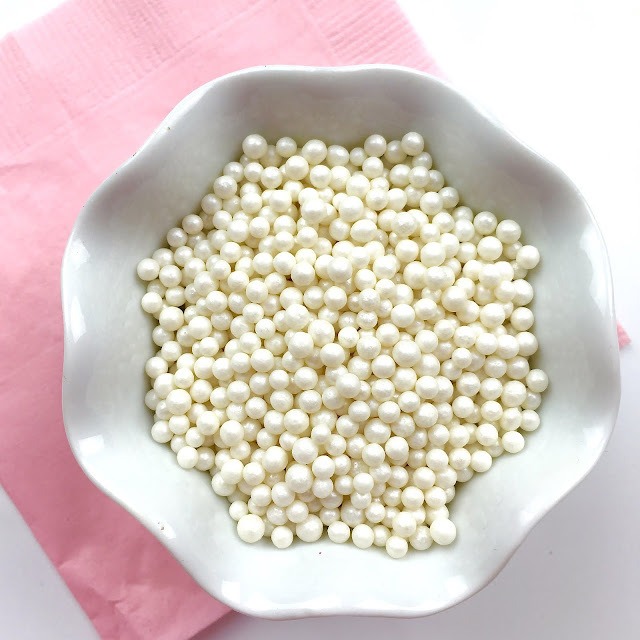 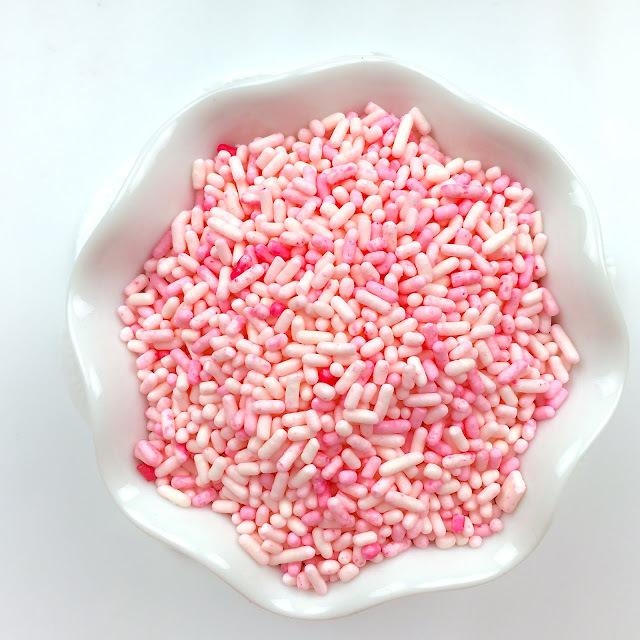 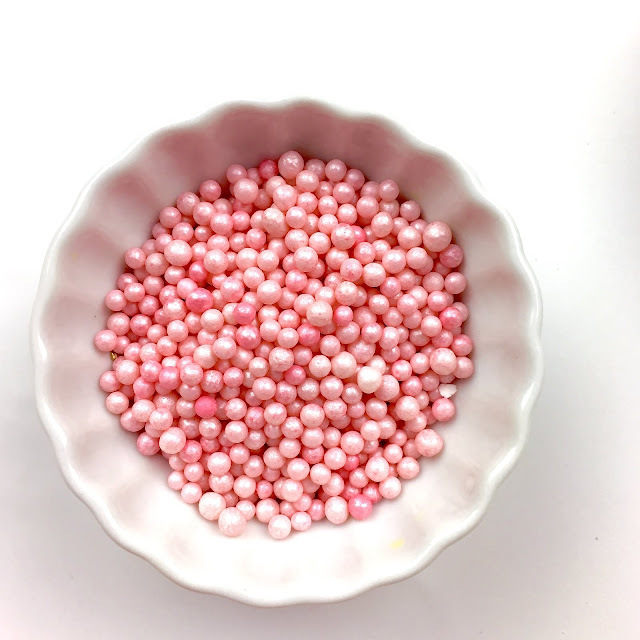 I bought white jimmies, nonpareil, and sugar pearls in bulk online (see links below in ingredient list), but most craft stores also carry small bottles of white sprinkles now, too! Then I added 1/2 cup of sprinkles to a Ziploc bag (or you can do this in a jar or Tupperware) with 1 drop of food coloring and 1 drop of flavoring extract (which is optional), zip the bag, and shake shake shake! In literally seconds, the sprinkles turned a beautiful shade of pastel pink! 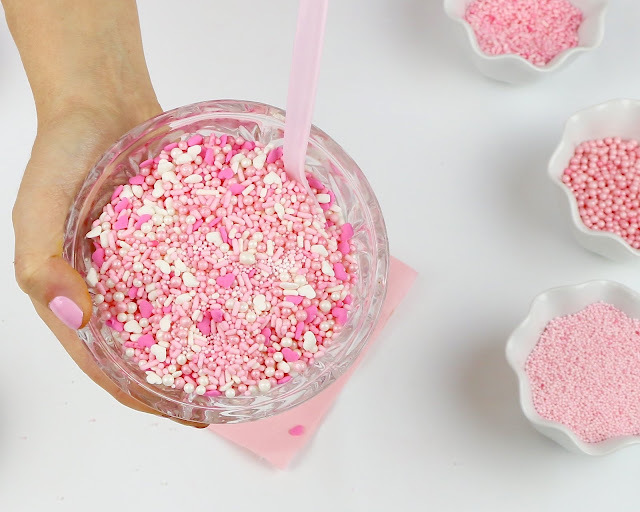 Now, you can definitely add more food coloring to reach your desired shade, but I found that about 1 drop of liquid food coloring, for every 1/2 cup of sprinkles, works great. Note that the color will vary a tiny little bit from sprinkle to sprinkle, as some pick up more color than others, but over all it is pretty uniform and looks beautiful! Then, just pour them onto a paper towel or wax paper lined baking sheet to dry for just a minute and that was it! 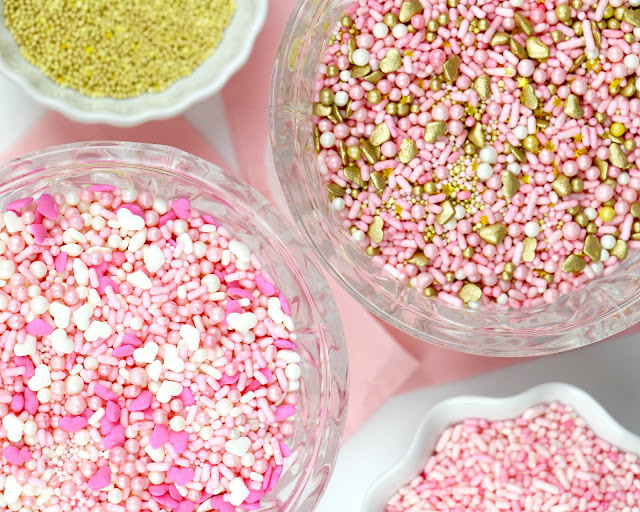 I couldn't believe how the colors didn't even bleed onto my hands or transfer onto the other sprinkles when I mixed them together. 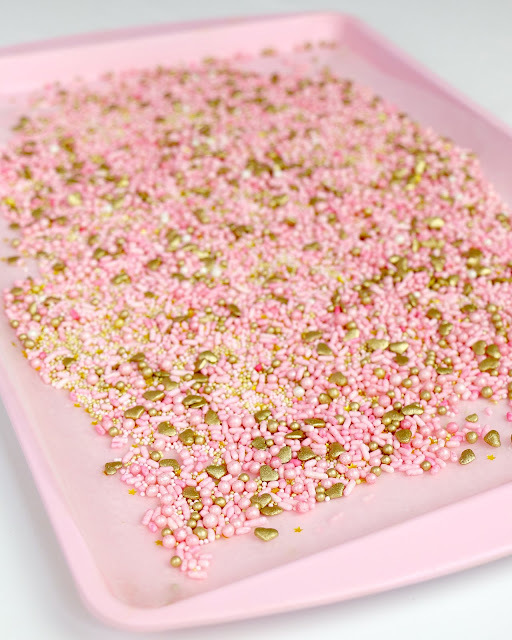 I did this with a few different types of sprinkles to create a little assortment. 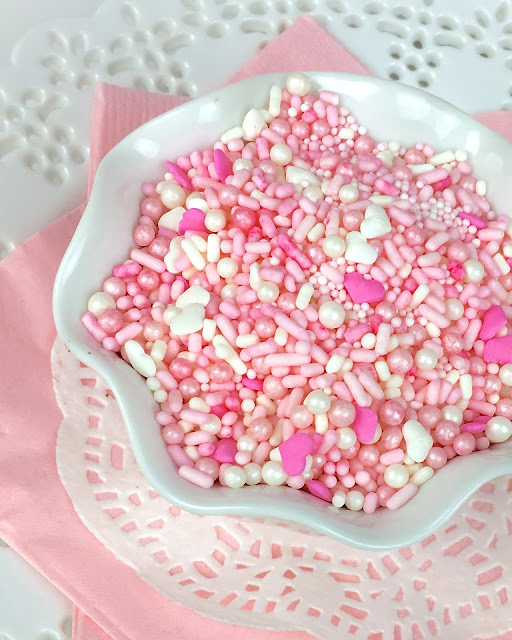 You can also probably do this with white M&Ms, white jelly beans, or any white candy too! 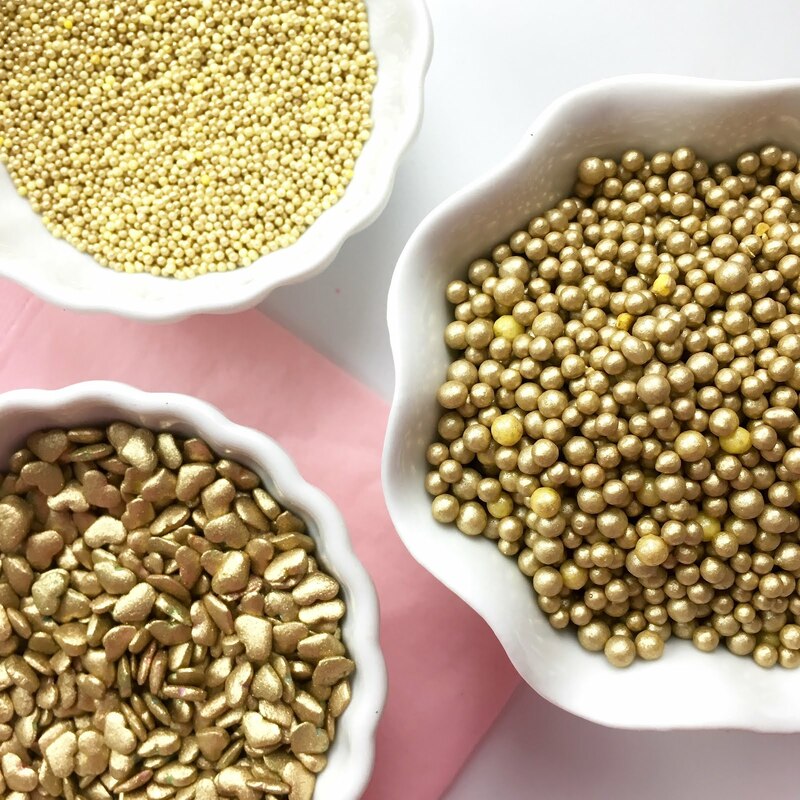 After tinting all of my pretty pink sprinkles, I wanted to try a little something with edible gold dust that you can get in a tiny bottle at your local crafts store or online. 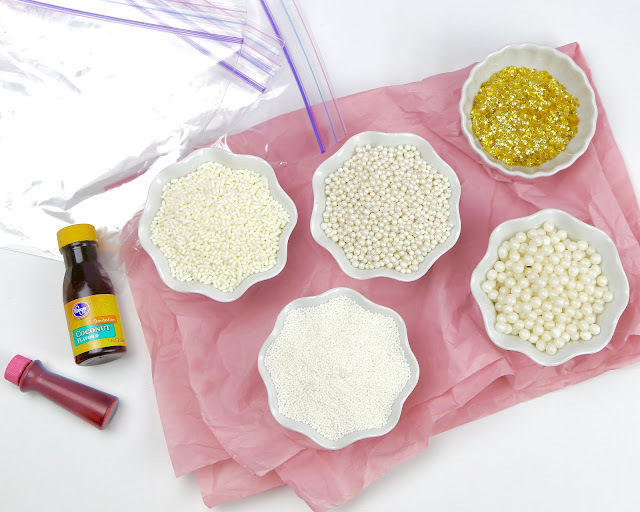 So I added a little shake, about 1/4 teaspoon, to the bag with some yellow food coloring and my sugar pearls and it worked! 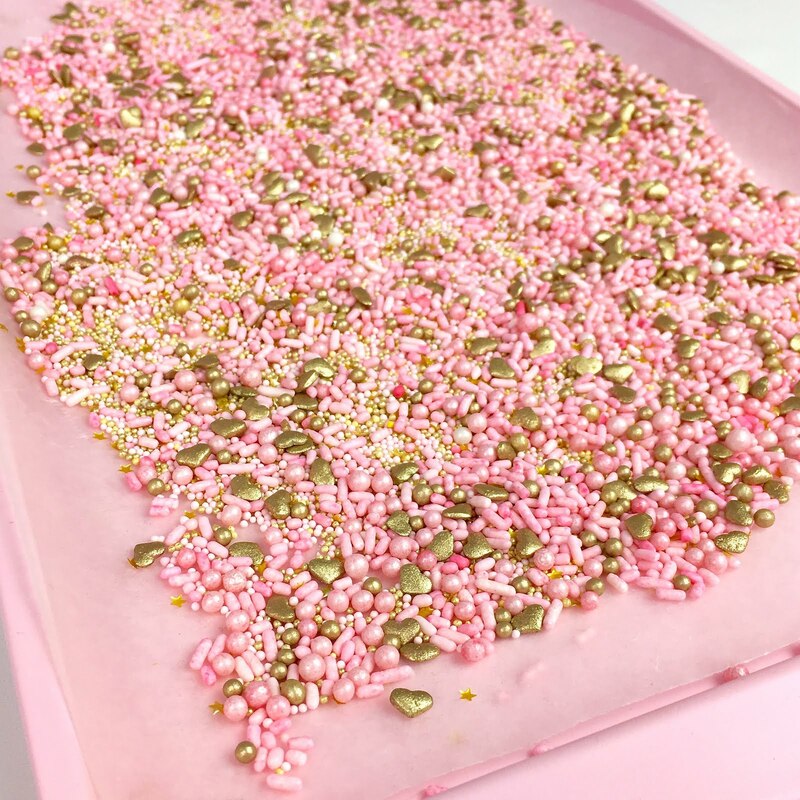 I then made little baby gold nonpareils, which were my favorite and even coated some pastel confetti hearts in the gold dust (these needed a little extra dust) to add to my collection. 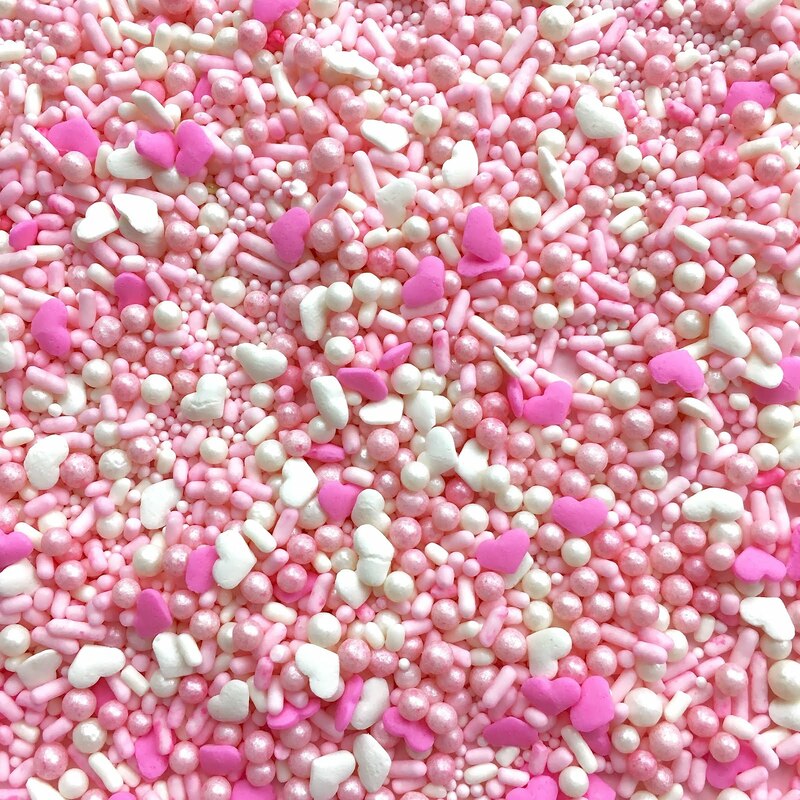 How magical is this sprinkle blend?! 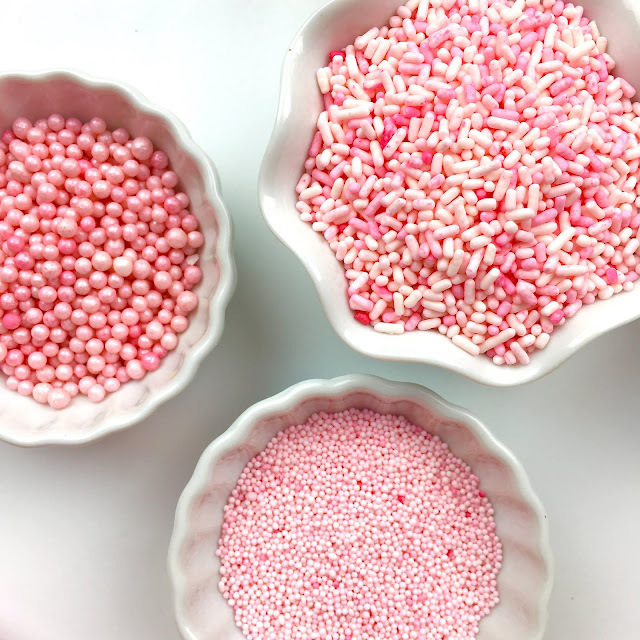 You can bottle these up, or store them in an airtight container or ziploc bag. 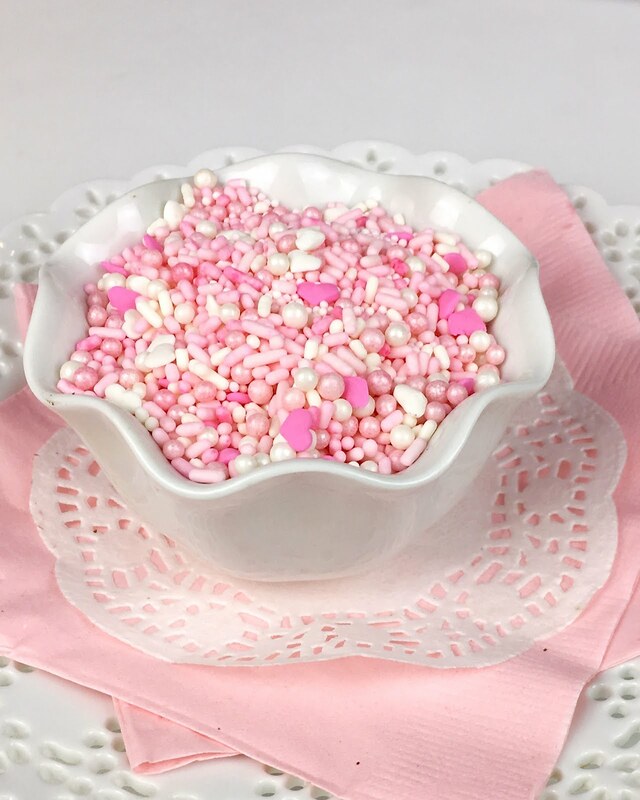 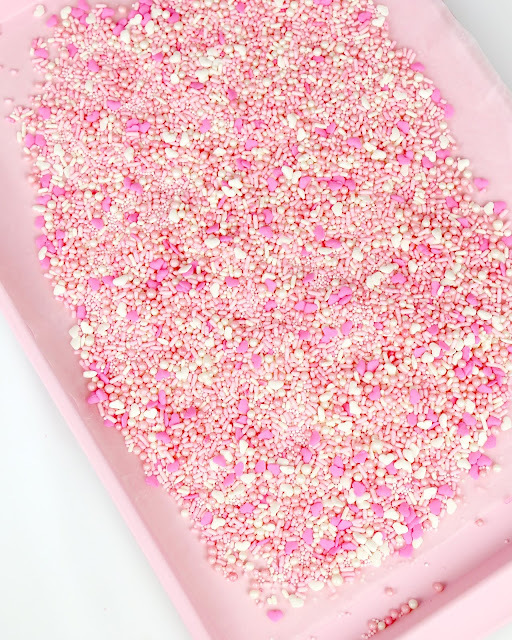 Ever since the amazingly talented Sweetapolita came out with her sprinkle shop online, I have been seeing these everywhere, so I knew I just had to try it myself to create my own custom blend, with all of the pastel pink, shimmer pearls, hearts and little pops of gold sparkles I wanted and I am so glad I did! 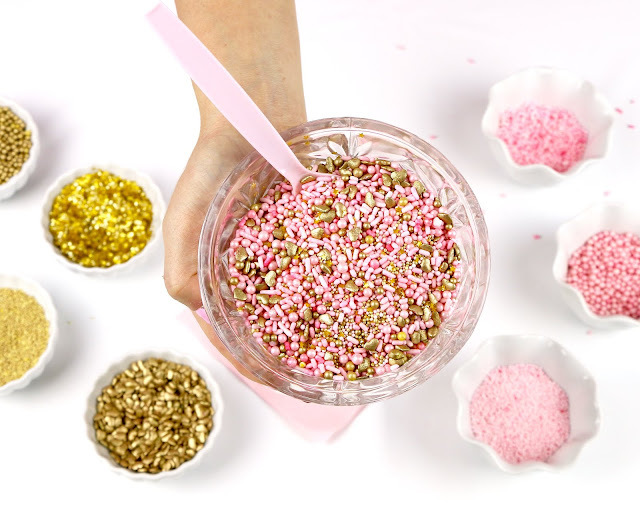 For this second blend I replaced most of the white jimmies and nonpareil sprinkles with the gold ones I had made for a beautiful, elegant, fancy gold and pink blend. 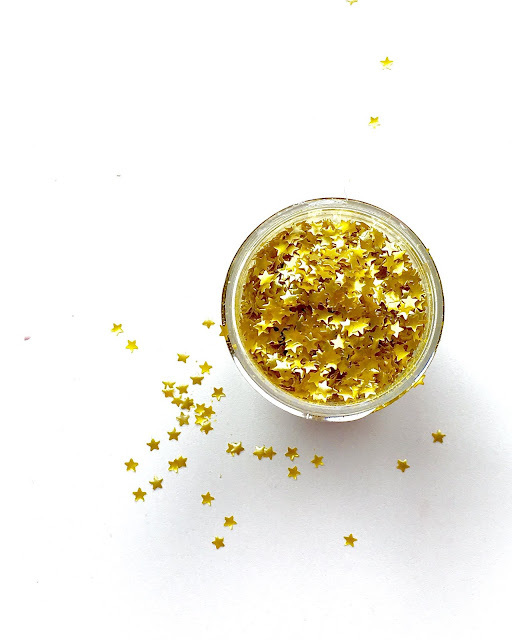 I even added some gold edible stars! 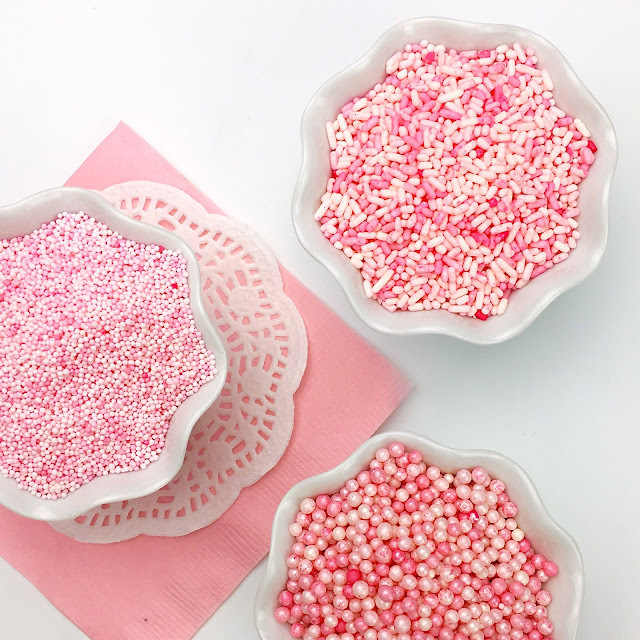 You can get creative and do all kinds of fun color blends and even get creative with the flavors, too! 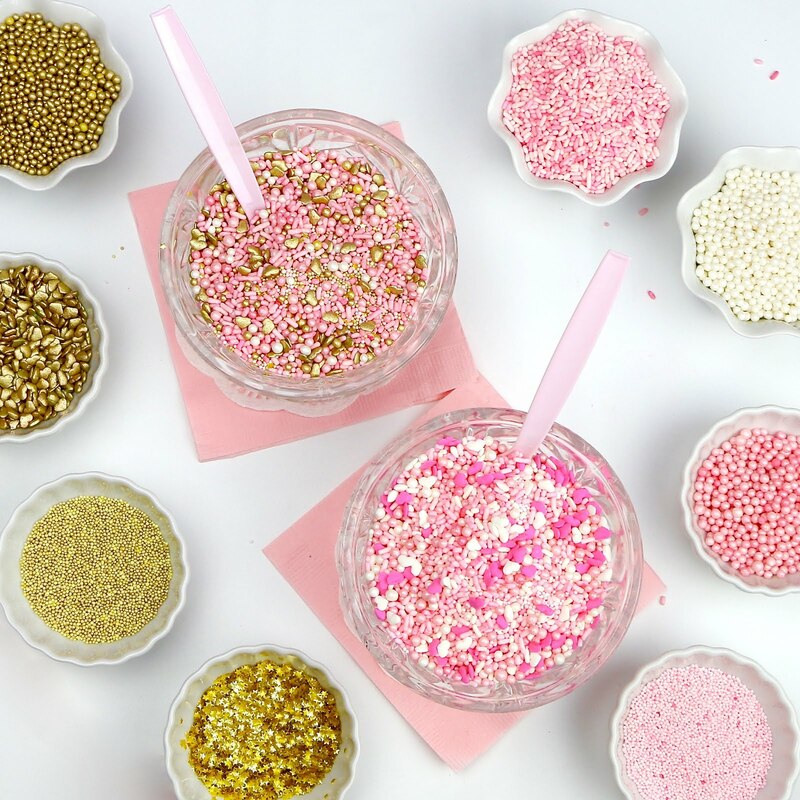 What kind of sprinkle blends do you want to make? 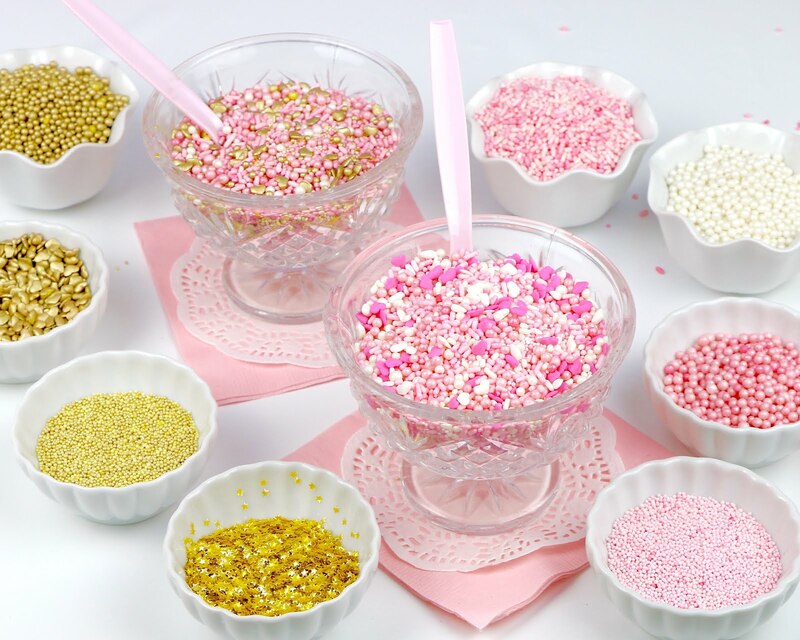 A rainbow of colors? All one shade? 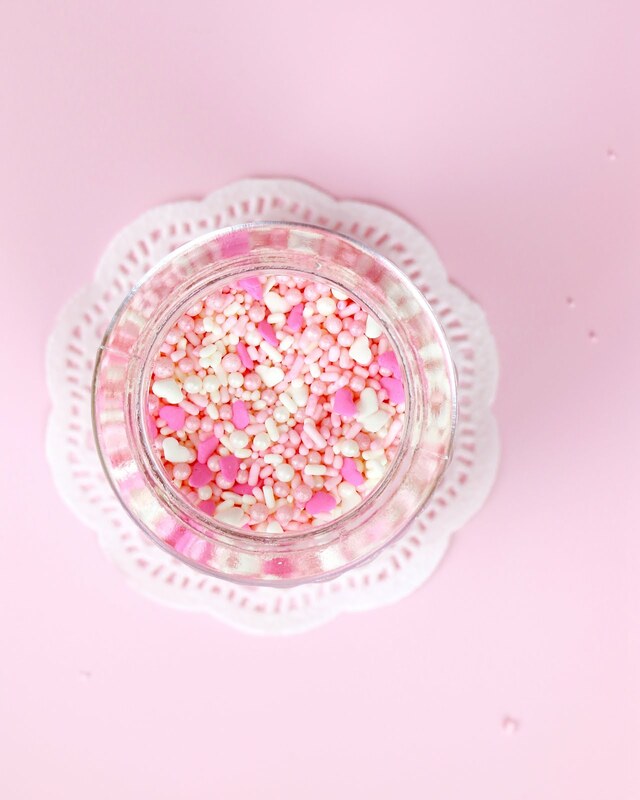 Then I used a piece of card stock to funnel them in to little candy jars, mason jars, and empty sprinkle containers. 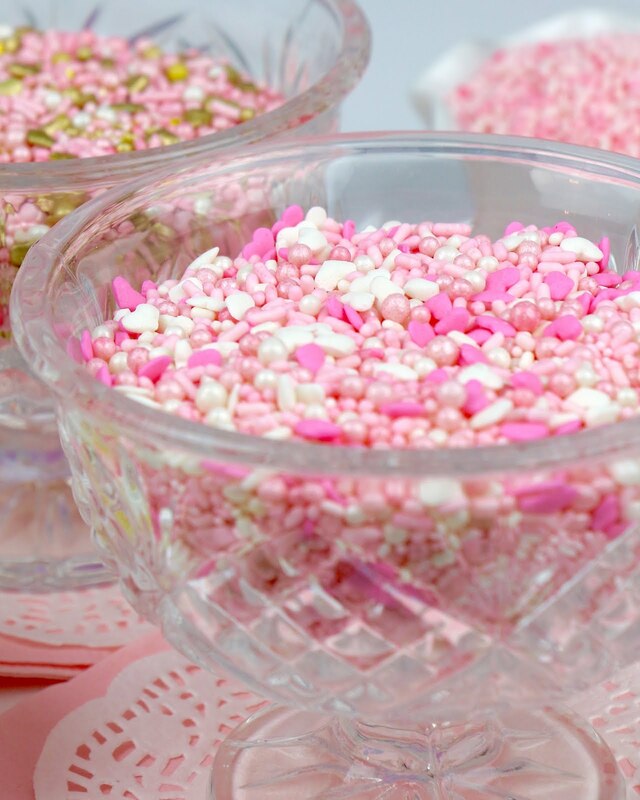 How cute would this be to give away as a party favor to match the theme of the party? 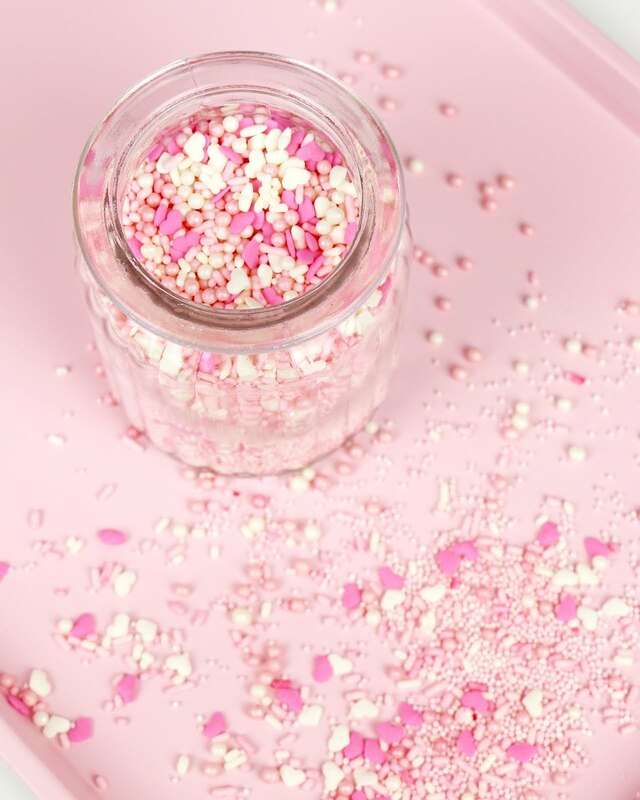 Add sprinkles and food coloring to a zip lock bag, jar or Tupperware. Add pearl/lustre dust and flavoring extract if desired. 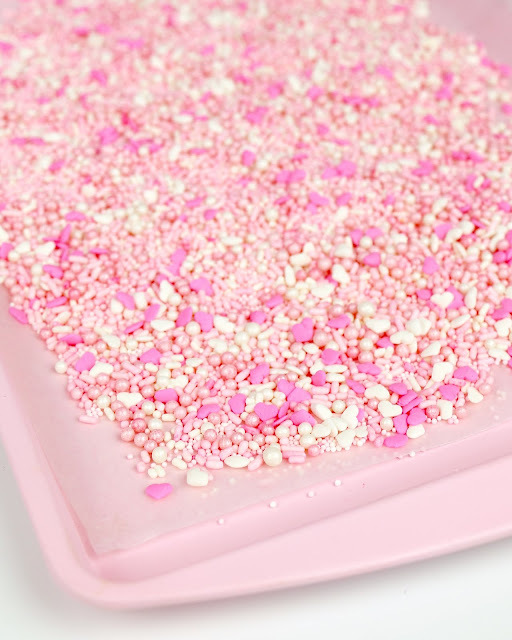 Close the bag and shake until all sprinkles are coated to your desired shade, adding more food coloring as needed. 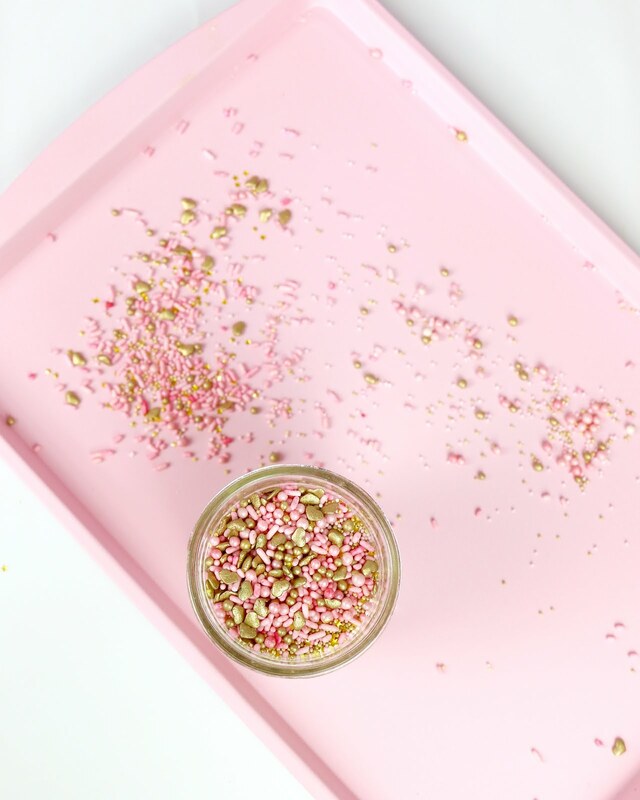 Pour onto a paper towel or wax paper lined baking sheet to dry for just a minute and store in jars, bottles or any air tight container at room temperature. 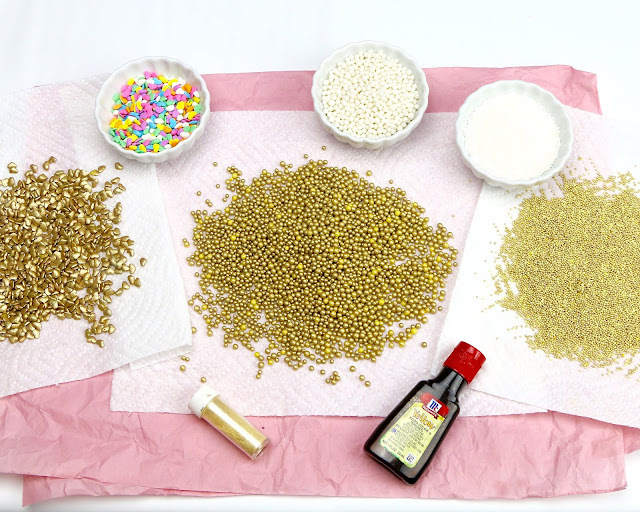 Mix together to create custom blends if desired.